Yesterday FBI and Oregon state police accosted members of the group occupying an abandoned Federal building in a land-rights protest. The standoff apparently continues but now one protester is dead and members of the Bundy family and others are in custody. Transits of the assault against the chart for the start of the occupation are interesting. Transiting Mercury and MC conjoin both the "natal" Pluto in Capricorn the Seventh and Uranus in Aries in the Tenth, triggering "death from others in authority" connected to "sudden action by authorities". 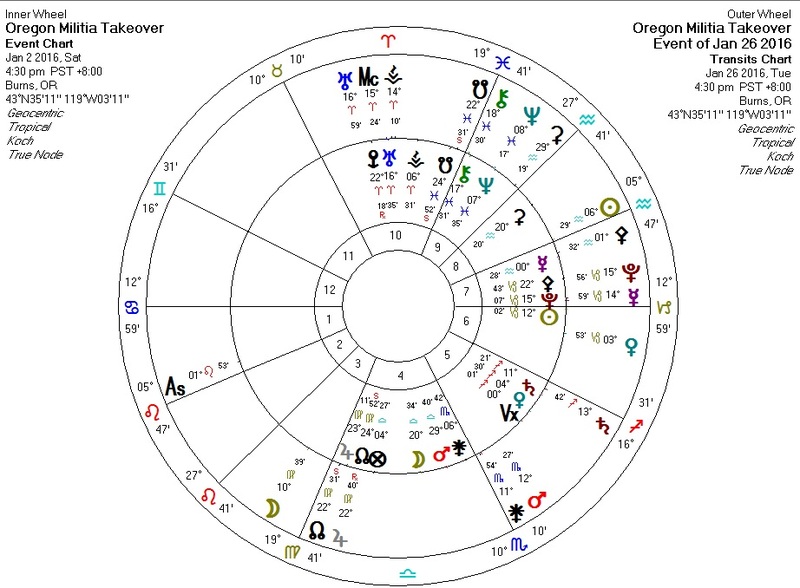 Transiting Mercury on the Seventh House cusp of the occupation chart semisquare Mars in Libra in the Fourth House conjunct Moon: again, the theme of "other" parties, here connected to earth/land. Transiting Jupiter tightly trine natal Pallas: under this kind of configuration, ethics or the lack thereof often reach the public eye. Transiting Sun in Aquarius at protest Eighth House cusp: "society" brings death. The Sun is going to be in there for nearly a month, which does not bode well for our protesters.